On July 11, 2007, I had a Cryoablation at Massachusetts General Hospital by Dr. Vivek Reddy. I participated in the pivotal Stop AF trial using CryoCath’s Arctic Front balloon catheter for pulmonary vein isolation. Dr Reddy also used the CryoCath Freezor Max catheter for treatment of my atrial flutter. I’d like to tell you about my recent Cryoablation, as well as the events leading up to it. 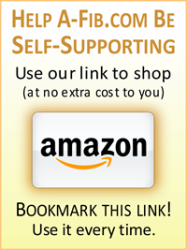 I’ve benefited greatly from the wise counsel on this site and hope my story will be helpful to others. I apologize in advance for the length. 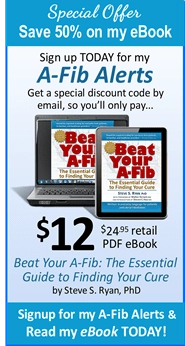 I’ll discuss my experience with A-Fib first and Cryo second. 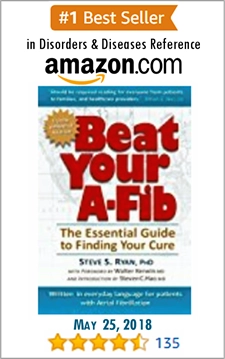 I was diagnosed with A-Fib almost a year ago exactly, at age 43. 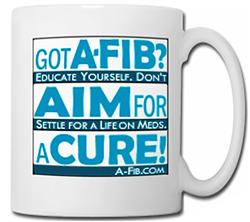 Once I knew what A-Fib felt like, I could see that I had been having events since the late 1990s and maybe earlier. I would often wake up in the middle of the night short of breath and had several episodes during athletic activities as well. Prior to my diagnosis I had thought these events were anxiety or asthma attacks. Consequently, I was seeing a therapist and had been on Klonopin (anxiety medication) for 4 years. I also was on maintenance doses of Flovent (asthma medication) which I took daily, and carried another inhaler for use during my attacks. I have been an avid endurance athlete since I rowed crew at Harvard. In 2001, I participated for the second time in the Canadian Cross-country Ski Marathon which is 100 miles over 2 days, the longest cross-country skiing event in the world. The first day was canceled due to high winds. Early the next morning while taking the bus to the start for the second day, I noticed that my heart rate monitor read 120 bpm just sitting there on the bus. “Boy, am I excited about this race!” I said to myself. Well, once the race started I knew differently! Everyone passed me. I must have fallen down 15 times due to weakness in my legs. Thinking my shortness of breath was due to asthma or lack of training, I kept going eventually and painfully finishing the 50 mile day. It never occurred to me it could be my heart! So a year later I was finally diagnosed. Initially no medication was prescribed as I went through the battery of tests: Holter monitor, chemical stress test, echocardiogram. Then one episode put me in the emergency room, and I was put on Norpace. Following several A-Fib breakthroughs, I was put on Pindolol, and the Norpace was replaced by Flecainide in September. The medication succeeded in stopping my A-Fib, but I had difficulty tolerating the side effects: shortness of breath, dizziness, low energy, heavy legs, night sweats, yuck! While all this was going on, I enrolled myself in the Cardiac Wellness Program at Dr. Herb Benson’s Mind Body Medical Institute to focus on heart health via meditation, relaxation, nutrition, and light exercise. 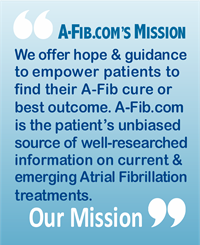 Their program helped me, but was more focused on heart disease than arrhythmia. At this point I limited myself to walking on a treadmill a half hour a day at 8 degrees tilt and lifting moderate weights at 15 reps twice a week. I meditated 20 minutes a day. In December I replaced the Pindolol with Metoprolol to no large improvement in side effects. In February, I replaced the Metoprolol with Cartia XT and saw some side effect improvement but also started having A-Fib events again. In early March I replaced the Flecainide with Rythmol and saw additional side effect improvements, but also started having A-Fib breakthroughs more often and of longer duration. I had been considering having an ablation since December but wanted to try out all my chemical options first. I knew I could continue on medication for several years, but my quality of life was definitely suffering. I was having difficulty concentrating at work, and all I wanted to do was sit in front of the TV at home. I was having breakthroughs every week or two, and I was concerned about the remodeling of my heart. I decided this had to change and that, although it had risks, ablation was a route I had to try. It seemed I would need an ablation sooner or later; and sooner, when my heart was still strong and I was still paroxysmal, seemed better. I chose Dr. Vivek Reddy at MGH (Massachusetts General Hospital) as the best guy in New England. My insurance would only cover me if I stayed in New England. We set a date for the procedure, and then I got a call from him offering me a chance to participate in a clinical trial for Cryoablation. The trial was such that, if I agreed to participate, I would have a 2/3 chance of getting the Cryoablation procedure immediately. I had a 1/3 chance of being placed in the control group and would have to take medications for 6 more months, then I could have the Cryoablation. I was naturally concerned about participating in a clinical trial. Ablations have enough risk as it is. I was cautious about adding more. But the more I learned about Cryo, the more I realized that it was theoretically safer than radio frequency energy. Cryo does less damage to tissue than RF and consequently is less likely to create problems like esophageal fistula, pulmonary vein stenosis, stroke, etc. And rather than using a pencil type catheter, in Cryo you can use a balloon catheter which theoretically can produce a more uniform ablation. While the CryoCath Arctic Front balloon catheter is newly approved in Europe, it was not yet approved in the US. Dr. Reddy was one of 2 doctors in the country to perform the first stage of the trial, with 20 patients each. Success rate with no medication was about 75%, comparable to RF ablation. Dr. Reddy had also performed another 20 in Eastern Europe. He had also demonstrated a Cryoablation at the Boston Atrial Fibrillation Symposium. Because of the success of the initial trial, the FDA approved the second “pivotal trial” of some 200 patients in many more centers across the country. This trial would use the next generation CryoCath Arctic Front balloon catheter with 2 balloon sizes instead of 1 and a more flexible sheath. When I spoke with Dr Reddy about my participation in the trial, he said I could expect a comparable success rate to RF, but with less risk. I asked him if it was his family member who had the choice, what would he do? He said he would choose the Cryo, even if he had to wait the 6 months extra to get it. He was convinced it was safer due to the reduced tissue damage. The real question according to him was whether the Cryo lesions would be effective for as long as RF lesions. Since this is new, no one knows the answer to that yet. Needless to say I decided to do the Cryo, constantly reading all I could to find a reason not to believe my doctor. 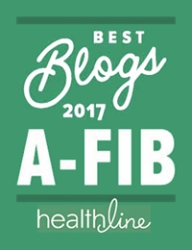 Beyond the obvious conflict of interest, everything I read said that Cryo had the most promise of being the next generation technique for A-Fib ablation, because it was likely to be safer. And I knew I had the most experienced Cryo guy in the country as my doctor. Just before my procedure, CryoCath published an article covering a study of over 300 cryoablations presented at the European Society of Cardiology (Europace) Conference in Lisbon. They reported an 84% success rate with paroxysmal patients. They also reported a 7.5% incident of phrenic nerve injury, which is high; although all of them resolved on their own in less than a year. The article noted that no esophageal fistula or pulmonary vein stenosis was reported. My procedure took place on July 11, 2007. Due to unrelated back pain which made it painful for me to lie flat, I had general anesthesia rather than the normal sedation. As a result, I can’t tell you much about the procedure experience since I was asleep. One thing I do know was that it took a long time, due to the study protocols. I was put under around 8 am and woke up around 3:30 pm for a total time of about 7 ½ hours. For the RSPV, ablation with the 23 mm balloon was stopped early (within seconds of capture) due to paralysis of the right diaphragm that significantly resolved within 10 minutes. At the end of the procedure, normal diaphragmatic motion was observed with pacing. (If this would have happened with an RF ablation, the paralysis of the right diaphragm might have been more difficult to resolve.) One other lesion was performed with the 28 mm balloon catheter. Following the procedure I was told that they successful isolated the pulmonary veins but that there was some phrenic nerve damage. The phrenic nerve helps the diaphragm expand so you can take in air into your lungs. Apparently they make you hiccup to be sure the phrenic nerve is not harmed. When I stopped hiccupping, they immediately stopped ablating and I resumed hiccupping about 10 minutes later. Upon examination, I was taking air into both lungs, but the chest X-ray did show one side of my diaphragm noticeably higher than the left. I was told this almost always resolves within a year, and they plan to follow this closely. During recovery in the hospital the same day and next day, I definitely felt discomfort in my chest—kind of a burning and heaviness that was worse when I lay down. I had no noticeable trouble breathing at all. I also noticed a sore throat that made it difficult to eat anything but soft foods. I went home on schedule the day after the procedure. Two days later I called my doctor as he instructed because I was still having some chest pain and wanted pain medication. When I mentioned I was still having pain when swallowing food, he decided to readmit me to be extra sure there was no damage to my esophagus (scary!). He told me he was very sure all was fine but wanted to be safe. First I had a chest CT scan that didn’t show anything definitive about my esophagus, but did show moderate fluid around my heart and a bit of fluid also in my lungs. Apparently no big deal other than to monitor (I had no fever). The next day they put a camera down my throat under sedation and discovered that I had an infection which could be treated with an antibiotic. Apparently the instruments they put down your throat with anesthesia had disrupted an infection already brewing, or perhaps created one. Either way it was easily treated, to my relief. I am now about 3 weeks post ablation and am back at work full time. I can function around the office pretty well, and I took a half hour slow walk yesterday that definitely taxed me but was doable. I still have some mild chest discomfort when I walk up stairs or otherwise exert myself, but it is tolerable and getting better steadily. I still don’t notice any breathing issues. This may change when I am able to do more rigorous activity, but we’ll see. I have my 1 month follow up appointment next week and will certainly know more then. I am very happy to have emerged relatively unscathed from the procedure, and I have been in sinus rhythm steadily since. I have great faith in Dr Reddy and feel I was well served under his care. I feel better and stronger every day, and I look forward to a full recovery. So far I am very glad I pursued the ablation option and the Cryo option as well. Again, I apologize for the length of my account. I hope you found it interesting and useful. Please let me know if I can answer any questions.Thanks. I am doing very well, feeling strong and have not had an AF event since my procedure. At my 1 month check-up, the phrenic nerve damage had completely resolved. Dr. Reddy discontinued my Rythmol at that appointment and my Cartia XT two weeks later. Once I stopped taking those medications, I felt my energy returning, my head clearing up, and most of the side effects I’d been experiencing vanished. The next month or so were spent taking half hour walks at lunch and slowly increasing my activity level. I had some persistent discomfort in my chest, particularly upon exertion, that seemed to be due to some lingering inflammation around my heart. A few days of Motrin cleared that up. I now do about 30 minutes of aerobic exercise 5 days a week at a heart rate of about 125 bpm. I also try to do weights (high reps) 2 or 3 times a week for about 20 minutes. This level of activity seems about right without pushing it too hard. Last Friday, following 2 holters 2 weeks apart, I was allowed to stop taking Coumadin. I am now completely off all of my meds and I feel better than I have in a long time. I can’t tell you how optimistic I feel about my future and how bright my mood is compared to 6 months ago. I am very glad I pursued the Cryoablation. As I have heard that the FDA recently approved Cryo-balloons for pulmonary vein ablations, I want to update you all on my health status. It is now 3 ½ years since I participated in the pivotal Stop AF trial using CryoCath’s Arctic Front balloon catheter for pulmonary vein isolation with Dr. Vivek Reddy and Massachusetts General Hospital. I am very happy to report that I have not had a single AF event since my procedure. I now exercise 1 to 1 ½ hours per day, 6 days per week and feel great. I honestly feel as good as I did before all the AF episodes started. I’m truly as good as new. Well, maybe a few years older! In speaking with Jeremy Ruskin, head of the program at Mass General (Vivek Reddy is now at Mount Sinai in NY), the patients that participated in the cryo-balloon trial have responded particularly well, with relatively low relapse and good recovery. I would recommend that everyone consider cryo, in addition to radio frequency. Generally, it is safer and has as good or better outcomes. But I would also suggest finding a doctor who has experience using cryo. A list of doctors who participated in the STOP AF trial should be available online if you search. Please feel free to reach out to me if you have questions about the cryo. I would be happy to share my positive experience. I recently took my 8 year old daughter hiking for 2 days up Mount Adams, the second highest peak in the Eastern US. We had a wonderful time, and it was a great reminder of how thankful I am for my experience with Cryoablation. I can be reached at terrydewitt2(at)gmail.com.